Power Your Mind naturally with Hypnosis to Improve your Health and Wellbeing especially for those who spend a lot of time on the computer! Computers can often make life a lot easier, but they can also end up doing a lot of damage to our bodies: for example, eye strain, body soreness, cramps, and clots. Many people who work with computers regularly, are often so focused on work or being productive, that they don't remember to prevent damage to their bodies. 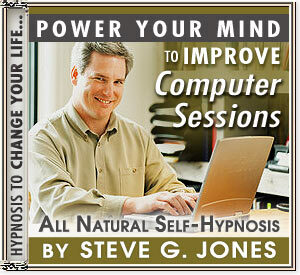 With our Power Your Mind to Improve Computer Sessions Hypnosis CD or MP3, you can naturally and effectively counteract the ill-effects of regular computer use. While these things are well-documented and very logical, it is often a problem for many people to actually remember to implement them. Now, you can make all these great counteractions a natural habit with our Power Your Mind to Improve Computer Sessions Hypnosis CD or MP3. In fact, your mind can be powered to not only remember, but you can start perceiving them as being part of a productive balanced computer session (instead of something annoying that takes up precious time)!